Rovio Entertainment and Hasbro, Inc. have teamed up to bring together two of the world’s largest and most popular entertainment brands with ANGRY BIRDS TRANSFORMERS! This fall, IDW will bring the mayhem to comics with the brand-new series, ANGRY BIRDS TRANSFORMERS, expanding on the unexpected backgrounds of this explosive crossover! When a DECEPTIHOG raid on the AUTOBIRD ship goes awry, the sought-after ALLSPARK is hurled into the expanses of space, only to find its way onto the shores of Piggie Island, and as its inhabitants will soon find out, the ALLSPARK is much more powerful than any creature could have imagined! 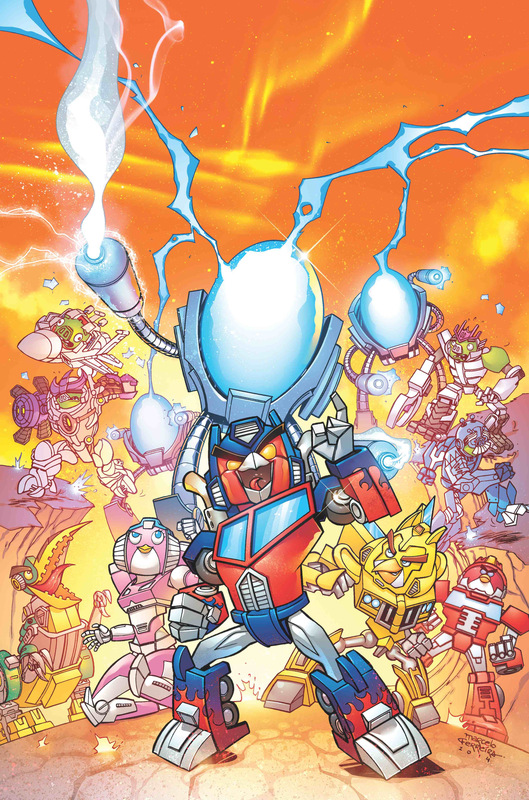 Written by Robots in Disguise scribe and IDW Senior Editor John Barber, ANGRY BIRDS TRANSFORMERS is taking the intergalactic epic to a whole new universe! An all-star flock of TRANSFORMERS artists will be contributing covers for the four-issue series, including Sarah Stone, Guido Guidi, Casey W. Coller, and Livio Ramondelli! Ramondelli will be kicking off the series, providing artwork for a framing sequence of issue #1, focusing on the TRANSFORMERS universe! From there, Marcelo Ferriera (Kung Fu Panda, TMNT New Animated Adventures) will take over on art duties for the series. This unique series offers comic readers a chance to explore two of the world’s most popular brands in a distinctly original way! Whether you’re reading Robots in Disguise and More Than Meets The Eye, or can’t smash enough Piggies, ANGRY BIRDS TRANSFORMERS welcomes everyone to join this collision of epic proportions! Sons of Anarchy Coverage: Risky Business?